Nikon introduced entry-level D60, a follow up to the D40x, in January 2008 at PMA. The 10.2 megapixel Nikon D60 then became the third entry-level DSLR that Nikon has brought to the market in just over a one year period. This is a stark change in the market life of DSLRs over the past several years. Generally speaking, camera makers have introduced replacements in their various lines approximately every 18 months. 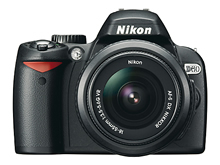 However, Nikon has seen great success in the entry-level DSLR market since the introduction of the 6 megapixel D40 at the end of 2006, which was followed by the 10.2 megapixel D40x in Spring 2007. The Nikon D60 is really more of an evolution of the D40/D40x line than a revolutionary update. Slated toward the entry-level market, the Nikon D60 brings some powerful and exciting features to the table that give entry-level users plenty of room to grow with the camera. Perhaps Nikon recognizes that 10 megapixels is plenty for an entry-level DSLR. With Canon and Sony pushing over 12 and 14 megapixels, respectively, in their entry-level shooters, Nikon sends the message that enough is enough and keeps the 10.2 megapixel CCD sensor from the Nikon D40x. The addition of the new EXPEED image processing concept is one of the headline upgrades to the Nikon D60. The Nikon EXPEED processing concept is part of what makes up the highly touted D300 and D3. The Nikon D60 features an ISO range of 100-1600, which is the same range of the predecessor D40x. Additionally, the D60 retains the ability to extend the ISO range to approximately 3200 (HI1) via an in-camera adjustment of a +1EV boost. The Nikon D60 provides frame rates of up to 3 frames per second, which is not rocket speed in today’s world of prosumer DSLRs capable of shooting 10 or more frames per second. However, the 3 frames per second available from the Nikon D60 are much faster than users of point and shoot cameras (i.e., the target market) are used to. The pop-up flash on the Nikon D60, with a guide number of 12, has the same 1/200s max sync speed as was found in the Nikon D40x. The D60 also features TTL flash control and a number of flash modes, including: auto, red-eye reduction, slow sync, fill-flash and rear-curtain with slow sync, among others. Like other Nikon DSLRs of recent history, the D60 supports Nikon’s CLS (Creative Lighting System). The 2.5″ LCD panel features 230,000 pixels and an automatic shutoff when the photographer’s eye moves to the viewfinder. The screen works as a camera information display, menu display and a preview screen for captured images. While 3″ LCDs are common nowadays, the D60’s display is still far removed from the 1.8″ screens of a few generations back, like the one on my squint-inducing Rebel XT. A new feature this time around is the auto-rotate function, which rotates the display automatically when you turn the camera vertically in info mode. While convenient, this feature is far from essential or breakthrough. The D60’s Active D-Lighting feature, which is also found in the flagship Nikon D3 and prosumer D300, can adjust the look of the final image while you shoot. This automatic process works in the highlight and shadow areas, compensating for difficult lighting conditions and producing optimized exposures with rich, smooth detail. The Nikon D60 retains the same 3 autofocus points that we saw in the D40 and D40x and is 48 points less than the 51 points in the Nikon D3 and D300. Additionally, the D60 features Nikon’s Multi-CAM 530 autofocus sensor module with TTL phase detection and AF-assist illuminator. There are 3 autofocus modes in the Nikon D60: Single-servo AF (S), Continuous-servo AF (C), Auto-servo AF (A). Predictive focus tracking is automatically activated according to subject status in single- and continuous-servo AF. Finally, in manual focus mode, the electronic rangefinder can be used to confirm in-focus subjects. Like the D40 and D40x, the Nikon D60 is only capable of autofocusing with AF-S and AF-I Nikkor lenses. However, it is compatible with the Type G and D AF Nikkor lenses without a built-in autofocus engine. This is a design choice on Nikon’s part that enables Nikon to make a smaller DSLR. While the D60 may not autofocus with all lenses, it features an electronic rangefinder, which is new to this camera line. The electronic rangefinder works to assist the user with manual focusing on non-AF-S/AF-I lenses. Even if you have no interest in manual focusing a lens, don’t let the lack of autofocus on older lenses deter you because there are plenty of great AF-S and AF-I lenses available. Nikon appears committed to this trend and is constantly releasing new AF-S lenses in a variety of focal lengths. Additionally, third-party lens makers like Sigma and Tamron appear to be committed to this trend as well. Sigma has a growing line of HSM (hyper-sonic motor) lenses available for the Nikon D60 and its predecessors. Tamron has recently jumped on the bandwagon with internal-motor-driven AF lenses as well. Unless you already have a collection of non-AF-S lenses, this should not be a deterrent in considering this camera – just make sure you know what you’re looking for when you go shopping for a new lens. Nikon claims that the Color Matrix Metering II ensures consistently balanced exposures for images with natural color and contrast. The 3D Color Matrix Metering II system is built around the former 1,005-pixel RGB sensor that’s been a part of Nikon’s metering system since the old F5. This newer version has an improved algorithm, which was first introduced in the Nikon D2X and has filtered down to consumer level cameras since then. To avoid picture-degrading dust particles accumulating near the imaging sensor, the D60 comes equipped with the innovative Image Sensor Cleaning function and Nikon’s exclusive Airflow Control System. These functions both reduce dust accumulation to give you even better picture quality. The D60 uses SD cards and is compatible with SDHC cards, which offer capacities of 4GB and above. I picked up a 4GB SanDisk Extreme III (which works great) for testing purposes even though I had some slower 2GB SD cards laying around. The D60 uses the same EN-EL9 battery as the D40 and D40x. In fact, I pulled the battery from my D40 in order to get the D60 up and running ASAP because I just couldn’t wait for the D60’s battery to charge. Nikon View NX and Nikon Transfer are included on CD ROM in the box with the Nikon D60. Personally, I found these programs to be pretty close to useless for post-processing purposes. Organization? Maybe. However, editing an NEF file (Nikon’s RAW format) with the View NX utility is almost silly. Additionally, while I can edit JPEG images with a number of free or existing programs that I have on my iMac (including iPhoto), the D60’s NEF file support is presently quite limited. Nikon was, however, kind enough to include a link to download a trial version of Capture NX. I had never used used Capture NX before and have been quite impressed with how well it works with the D60’s NEF files. Unfortunately, if I want to keep using Nikon’s editing program with my new Nikon D60, I’ll have to shell out $125 or so. To me, this was the biggest disappointment for the Nikon D60. Nikon should take a lesson from Canon, among others, and package a respectable post-processing app with their $750 DSLR. The Nikon D60 does not have quite the heft to it that you will find on the prosumer models (e.g., Nikon D300, Canon 40D, etc.). In fact some consider the Nikon D60 quite small. Surprisingly though, the grip works quite well on such a small DSLR. I’ve used a Canon Rebel XT for about three years now. The Rebel XT has always felt a little too small in my hand. While I have similar concerns with the Nikon D40-D60, the grip feels much better than the Rebel XT. Among the new entry-level DSLRs that I’ve had my hands on, I prefer the grip on the Sony A200-A350 cameras (all are built around the same housing). Along with a nice grip, the controls are easily accessible via your thumb or forefinger while shooting. The scroll wheel is well placed for thumb control on changing shutter and aperture settings. The scroll wheel works quite well with the exposure comp. button located right behind the shutter button. This makes it easy to change settings on the fly. The D60 follows the same fundamental control settings and navigation that were found in the D40 and D40x. Unlike more advanced DSLRs, the D60 family of Nikon DSLRs offers very limited customization of camera settings through the buttons. This is probably a good thing for beginners. If you want more instantly-accessible control, this probably isn’t your camera anyway. The display shows camera information in the LCD panel on the back of the camera rather than on a top-side display like you’ll find on more advanced cameras. You can choose between a graphical display format, which is the default setting, or a classic display format, which isn’t so pretty. In my opinion, the classic display does a better job of displaying relevant information. By pressing the “i” button located next to the display, you can access several of the most commonly-used settings. While it’s nice to have access to settings like image quality, ISO, focus and metering modes, and flash comp., you’re still two-steps removed from the quick access you expect from higher priced DSLRs, such as a dedicated ISO button. However, the D60 has a programmable Fn (function) button near the lens mount that’s easily accessible with the thumb of your left hand. One of the first things I did when I was setting up the D60 was to program the Fn button as a dedicated ISO button – helpful, but not quite ideal for more advanced users. Setup – time, memory card formatting, sensor cleaning, MLU, etc. Granted, there are a lot of customization options; however, many are buried far too deep to allow quick access if it’s needed. Getting to the actual meat of using the camera, it’s quite easy to pick up the D60 and start shooting with it. In full auto mode, the D60 decides most of the settings for you, including which of the three autofocus points are used. Switch to program, aperture priority, shutter priority or manual mode and you obtain the ability to exercise much more control. One setting that I like to have control over is the right focus point for the job at hand. Unfortunately, the choices are rather slim. The D60’s limitation to 3 AF points is a very disappointing and limiting feature. The 3 AF points split the viewfinder across a mid-level horizon line. One is dead center in the frame and an additional focus point is found to its left and right. The addition of a couple more AF points above and below the center point would be most helpful. Framing horizontal portraits almost always requires the D60 user to obtain a focus lock on the face(s) and then reframe downward. These 3 AF points are a far cry from the 51 found in the big brother Nikon D3 and D300. Even though the AF points are limited, the D60 is pretty quick to acquire autofocus with the kit lens. While I don’t have measured response times to share (I’m sure you can dig those up in a more technical review elsewhere), it’s plenty responsive for my needs. I imagine that most consumer DSLR users will be satisfied as well. The new 18-55mm f/3.5-5.6 VR lens rocks. If you’ve never used vibration reduction before, you are in for a treat. Nikon balances the playing field against Sony, Olympus and Pentax, which feature sensor-based stabilization in their cameras, with the inclusion of an image stabilized lens in the D60 kit. I’m impressed with the results from Nikon’s VR. The addition of the VR-enabled kit lens really helps the D60 stand out from the D40x. Fret not, however, if you own a D40 or D40x, the 18-55mm VR lens is available separately for under $200. Want to know what VR can do for you? Check out the sample images with and without VR below. The Nikon D60 produces great images. Both Nikon and Canon have produced remarkable DSLRs over the past several years. As far as entry level cameras go, the Nikon D60 offers just as good image quality as anything else out there right now. I am not going to discuss the intricacies of noise control, dynamic range or corner sharpness of the kit lens. Other camera review sites go into plenty of detail and probably do a much better job than I could anyway. What I can tell you, however, is that I’m very impressed with the D60’s images throughout the entire ISO range. If you are interested in buying the Nikon D60 as an upgrade from a point & shoot camera, then you will be pleasantly surprised at the difference. Family snapshots, vacation photos and soccer games will all look great. Common sized prints from 4×6 to 8×10’s will look great. Chances are that most D60 users aren’t going much larger than an 8×10 on a regular basis. I can’t say that I have. However, I’ve printed 20×30″ prints from the 8.2MP Canon Rebel XT with solid results. The 10.2 megapixels from the D60 should produce even better prints at big sizes, especially at lower ISOs. Nikon hasn’t necessarily pushed any boundaries with the Nikon D60. That’s not a bad thing though. The D60 follows a couple of solid entry-level cameras that didn’t really need a whole lot of improvements. Many will curse the lack of autofocus with older Nikon lenses; however, I would speculate that the majority of Nikon D60 users will not venture beyond a couple of lenses. Pairing the impressive $200 55-200mm VR lens with the D60’s 18-55mm VR kit lens will satisfy most entry-level users until they are ready to branch out into more intermediate skill levels. Even then, there are plenty of autofocusing lenses from Nikon and Sigma to suit the D60. I can highly recommend the Nikon D60 for new DSLR shoppers with one caveat: If you don’t have an image editing program, then at the very least, download Google’s Picasa for your JPEG image files. Otherwise, you’ll love your choice for stepping into the new world of DSLRs. If you’ve got an entry-level camera and are thinking of upgrading to the D60, be prepared for a mediocre upgrade. Actually, you might even consider skipping the D60, saving your money and buying a new lens or maybe a Nikon SB-800 flash. First off, consider going to your local camera store (and I don’t necessarily mean Wolf Camera at the mall). By going to your local camera store, you’re supporting your community and you just might build a lasting relationship with people you can rely on when you need some help or answers. If you’re buying online, I recommend sticking with Amazon, B&H Photo or Adorama. These three vendors are reliable, trustworthy and generally have the best (legitimate) prices. Still not sure about the Nikon D60? Head on over to Photography Bay’s Nikon D60 Reviews and Resources page for the latest news, reviews and more. IMHO Nikon D60 is designed for a professional photographer while D40 and D40x are for entry level consumer to the DSLR scene. Eric I am looking for a great camera,2008 model that shoots the video in a MOV file. Does this camera do that? Thanks!